Okodia SLU, pursuant to the personal data protection legislation in force, hereby informs that the data collected via the forms on the www.okodia.com website are included in the specific automated files for users of Okodia SLU services. The purpose of the collection and automated processing of personal data is the maintenance of the commercial relationship and the performance of information, training, advisory and other activities by Okodia SLU. These data will only be transferred to other entities in order to fulfil the aforementioned purpose. Okodia SLU takes the measures required to ensure the security, integrity and confidentiality of the data pursuant to Organic Law 15/1999 of 13 December on Personal Data Protection (LOPD). Users may exercise their rights of access, rectification, cancellation and opposition acknowledged in the aforementioned LOPD at any time. These rights may be exercised by users by email sent to info@okodia.com or by writing to the postal address PO Box 37007, 08011 – Barcelona (Spain). The user declares that all the data provided by him or her are true and correct, and undertakes to keep them up to date by notifying Okodia SLU of any changes. Should the user include personal data files in the shared hosting servers, Okodia SLU will not be held liable for the breach of the LOPD by the user. Okodia SLU processes personal data on servers located in the USA, such as Google, MailChimp, Dropbox… companies subject to the Safe Harbor program. Therefore, by using our services or communicating electronically with our organization, you understand and accept such transfers. Okodia SLU hereby informs that, as a provide of data hosting services and by virtue of the provisions in Law 34/2001 of 11 July on Information Society and Electronic Commerce Services (LSSI), it retains the data required to identify the origin of the hosted data and the time when provision of the service started for a maximum period of 12 months. Retention of these data has no impact on the privacy of communications and they may only be used as part of a criminal investigation or for the protection of public safety, when they will be made available to any judges and/or courts or the Ministry that might require them. Communication of data to the national Armed Forces will be made pursuant to the personal data protection legislation. 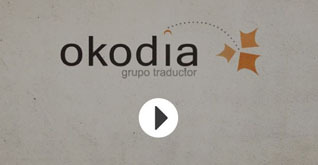 Okodia SLU is the owner of the copyright, intellectual and industrial property rights, know how and any other rights related to the contents of the www.okodia.com website and the services offered therein, as well as of the programs required for their implementation and the related data. Reproduction, publication, and/or non-private use of the total or partial contents of the www.okodia.com website without previous authorisation in writing from Okodia SLU are forbidden. The user must respect the third-party programs made available by Okodia SLU, even if they are free and/or publicly available. Okodia SLU holds the exploitation rights and intellectual property rights over the software. By purchasing the service, the user acquires no right or licence over the software required to provide the service or over the technical information for service monitoring, with the exception of the rights and licences required for the execution of the services purchased and only for their duration. For any action that exceeds the scope of the agreement, the user will require an authorisation in writing from Okodia SLU. The user is forbidden to access, modify, view the settings, structure and files of the servers owned by Okodia SLU, and shall assume any civil and criminal liability for any incident that might take place in the servers and security systems as a direct result of a negligent or malicious action on the part of the user. Any use of the services provided by Okodia SLU that breaches intellectual property legislation is forbidden, in particular: – any use that breaches Spanish law or third-party rights, – the publication or broadcast of any content which, in the view of Okodia SLU, is violent, obscene, abusive, illegal, racially discriminatory, xenophobic or slanderous, – cracks, software series numbers or any other content that breaches third-party copyright, – the collection and/or use of other users’ personal data without their explicit authorisation or breaching Organic Law 15/1999 of 13 December on Personal Data Protection, – the use of the domain email server and of the email addresses to send spam. Okodia SLU makes backup copies of the contents hosted in its servers. However, it will not be held liable for the loss or accidental deletion of data by users. Likewise, it does not guarantee full recovery of the data deleted by users, as said data might have been eliminated and/or changed during the elapsed period since the latest backup copy. The services offered, except for specific backup services, do not include the recovery of the contents held in the backup copies made by Okodia SLU when this loss is caused by the user. In this case, a fee will be established in accordance with the degree of complexity and the size of the recovery, following the user’s acceptance. Recovery of deleted data is only included in the price of the service when the loss of the contents is due to causes attributable to Okodia SLU. Pursuant to LSSI, Okodia SLU will send no advertising or promotional communications via email or by other equivalent electronic means of communications that have not been previously requested or expressly authorised by their recipients. In the case of users with whom commercial relationships previously exist, Okodia SLU is authorised to send marketing communications pertaining to Okodia SLU products or services that are similar to those that were initially purchased by the client. In all cases, the user may request not to be sent any more marketing communications through the Customer Service channels after giving proof of his or her identity.